In December, the 2018 USA Farm Bill was passed allowing industrial hemp to be legally produced on a federal level. Industrial hemp is defined as cannabis plants with no more than 0.3% THC (tetrahydrocannabinol), the compound in cannabis that is psychoactive. 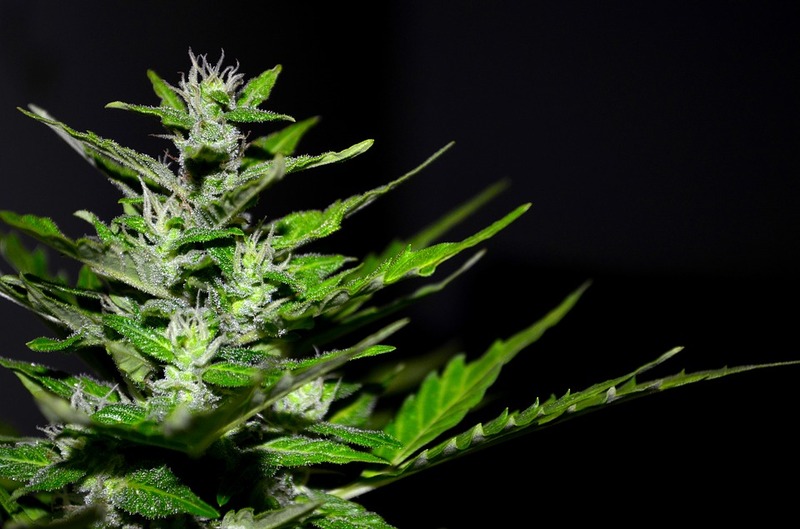 Cannabis containing high levels of THC is generally termed marijuana. Even though industrial hemp is now federally legal, the various states have their own regulations controlling industrial hemp. Industrial hemp encompasses many products, including hemp fiber, hemp seed for food and oil, and herbal extracts with high levels of non-psychoactive cannabinoid compounds, such as CBD (cannabidiol), used for health benefits. Hawaii is an awesome place to grow hemp due to the great year-round climate which allows the hemp to realize its full potential. Hawaii’s industrial hemp pilot program allows licensed growers to produce limited amounts (currently up to 10 acres) of industrial hemp for the above products, including CBD. However, getting and keeping a license is not easy. One must have a secure growing site and a solid research plan, along with completing regular reports, getting crops tested, and abiding by other rules and regulations. Crops testing out over the allowed 0.3% THC generally have to be destroyed. Therefore, excellent quality genetics are required. Marijuana, which is cannabis containing more than 0.3% THC, is still federally illegal in the USA. However, some states allow limited marijuana use. These regulations vary greatly with some states even allowing recreational use of marijuana. To obtain a state medical marijuana license, an individual must see a specialized medical doctor who ascertains the need of the patient for the product, and then work with the state to obtain the license. While a complex process to go through, many patients find welcomed relief of various symptoms with the use of this natural plant product. Uruguay was the first country to formally legalize cannabis, including marijuana. The law went into effect in 2017. Canada was not far behind in allowing recreational use of marijuana (on a limited basis) and CBD production in the fall of 2018. Canada has allowed medical marijuana use with licensing since 2001. Industrial hemp production for seed and fiber has been allowed since 1998 with licenses. Ever thought about growing hemp? High CBD dried flowers sell for $160 an ounce retail. Beyond Organic Consulting works with growers to obtain hemp licenses, perform required research, and optimize soil for growing the best quality and most abundant crops. See https://beyondorganicresearch.com/consulting/ to learn more. 5G promises faster communication speeds, but at what cost to our environment and, subsequently, our health? Electromagnetic fields (EMFs) are already negatively impacting our health as shown by numerous studies which are ignored by industry. Now 5G networks being rolled out this year bring even stronger destructive EMFs. Here’s an article from Natural News with a video from Dr. Gabriel Cousens that further explain what we are faced with. 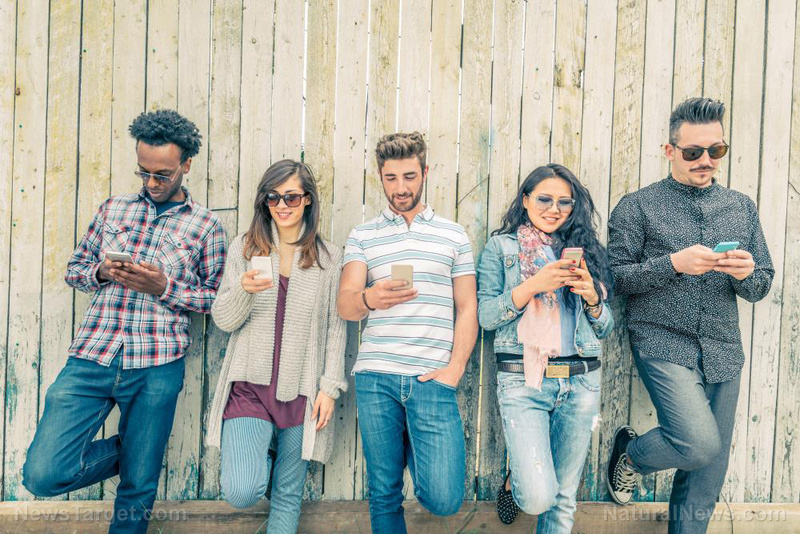 (Natural News) Dr. Gabriel Cousens calls 5G “a complete, unmitigated health disaster.” But, what exactly is 5G, what dangers does it present and what must each one of us be aware of? PC Mag explains that the “G” in 3G, 4G etc. refers to a different generation of wireless technology. Each generation is differentiated by a change in encoding methods which make it incompatible with the previous generation. 5G promises faster speed, more responsiveness, and simultaneous connectivity for more devices than previous generations. So 5G networks need to be much smarter than previous systems, as they’re juggling many more, smaller cells that can change size and shape. But even with existing macro cells, Qualcomm says 5G will be able to boost capacity by four times over current systems by leveraging wider bandwidths and advanced antenna technologies. The goal is to have far higher speeds available, and far higher capacity per sector, at far lower latency than 4G. The standards bodies involved are aiming at 20Gbps speeds and 1ms latency. 5G will make use of a type of encoding called OFDM, and is likely to rely on a network of cells as small as household routers rather than on huge towers radiating over larger distances. Dr. Cousens warns that since 5G uses a much shorter wavelength, transmitters will have to be erected every 500 feet. This means that such transmitters will appear in schools, at bus stops, and “all over the place.” Even if you don’t use a cellphone, therefore, 5G technology means you will still be in an EMF zone continually, unable to escape its effects. Dr. Cousens says that while humans can cope with the effects of EMFs for about three years at most, thereafter serious problems start to arise and we become more susceptible to circulatory, mental, digestive and immune diseases. This type of exposure may be a large contributing factor to the fact that about 40 million people are depressed, 10 million of them acutely (or severely) so. This has resulted in huge numbers of Americans being prescribed toxic antidepressants. Multiple studies have confirmed a link between EMFs and cancer, diabetes, heart disease, autoimmune disorders and other chronic, debilitating diseases. This is serious, especially when you consider that at least 50 percent of the U.S. adult population now has one chronic debilitating disease, while some have multiple such illnesses. Dr. Cousens warns that experts compare continuous exposure to 5G to being in a microwave oven for 17 minutes on full power. 5G literally cooks your brain and your body. While there are certainly commercial benefits to 5G technology being installed in U.S. cities, exposure to it means we will be much sicker than the competition. And since sick people don’t perform well at their jobs, ultimately, 5G represents economic disadvantages, too. So, what can we do about it? Dr. Cousens believes that we need to take thoughtful action, do personal research on 5G, and then get out and speak about it. Our own health and the health of future generations depends on it. Practical tips from Dr. Jana– Yes, there are steps we can take to minimize effects of EMFs. First is to minimize exposure by distancing ourselves from sources such as towers and “smart meters”, minimizing cell phone use, using shielding products, hard-wiring our computers (no wi-fi), and eating Nutrition Grown foods to supply us with protective nutrients and phytonutrients. Particularly helpful is rosemary, which you can grow yourself! We were blessed with grant funding this spring for starting the 2nd year of our Nutrition Grown Research and Demonstration Garden. Our first order of business was to thoroughly re-analyze the soil. Then we added our fertilizers and amendments. We repeat this procedure every 6 months to gradually bring our soil to optimal levels of fertility. Because we have to feed the soil slowly over time to avoid harming the beneficial microbes, it can take years to optimize the soil, but all the effort is worth it! Balanced, healthy soil (with all its beneficial microbes) is what makes healthy plants, and (subsequently) happy, healthy people! Numerous researchers are coming to the conclusion that human health really does begin in the soil. The microbial life in the soil AND ON THE PLANTS can be related to our own microflora, which is mainly in our intestinal tract, but also on our skin, and even in our organs. A healthy variety of microorganisms performs a myriad of functions. Some microbes make amino acids, some make vitamins. Other microbes make nutrients more available and some are even involved in cell signaling, which can control genetic expression. Each food plant has its own set of compatible microbes. Interacting with food plants in the raw state, with their live beneficial microbes, can be very important for our health. Food is information. This is part of the reason why raw food diets can be so healing. We evolved with the plants. We need to have our daily dose of Nature–touching, smelling, eating. Having your own healing Nutrition Grown garden with a variety of herbs, vegetables and fruits can be the quickest route to great health. It’s Nature’s “farmacy”! It sure is exciting to watch the improvements over time! As a nutritional and horticultural researcher who has worked to bridge an understanding from soil to human health, I am thrilled about the release of this enlightening video. Health truly is about nurturing nature and nature nurturing us. It all starts at the garden or farm, creating “perfect soil” to grow “perfect food” to heal our bodies. Testing soil to know what fertilizers to add and testing plants to understand what they need, as well as testing the final food products to determine what really is and is not there is how we move to better quality food production. This video is an interesting mix of health professionals who understand that health starts in good soil. Enjoy, and share it with your friends. Happy Mother’s Day, even if you are just a “mom” to your plants! Work continues in the Nutrition Farming for Hawaii (NFH) Research and Demonstration Garden. Here are some more impressive examples of increased nutrient content from our first year as compared to USDA Food Nutrient Database published values. 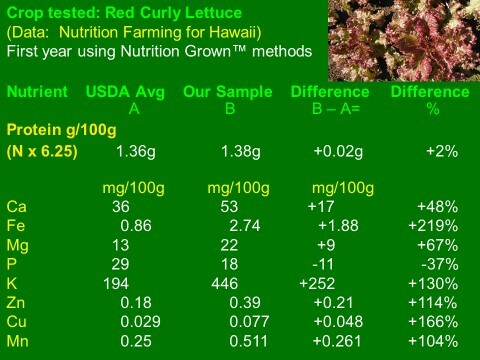 Below are two crops, red curly lettuce and green onions. 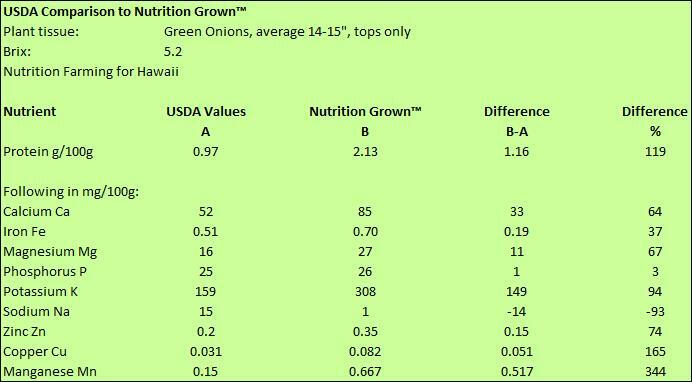 Most values show good gains over the USDA values. 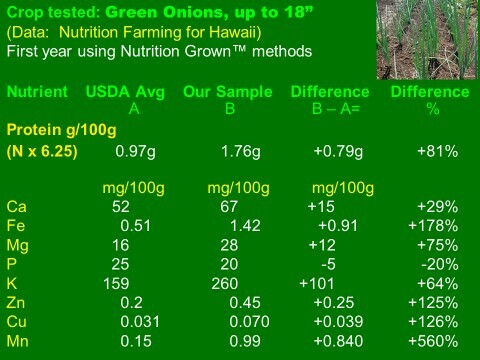 You will notice the NFH crops’ phosphorus is not as high. 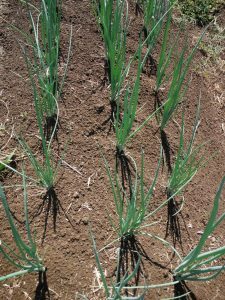 Phosphorus is a particular problem in Hawaii soils. We put on quite a bit of soft rock phosphate, an organically-approved type of phosphorus, which takes some time to become fully available to the crops. I’m not too worried about it because phosphorus is rarely a missing element in human nutrition. We will continue to tweak the soil to get it just right. We are just about ready to do a retest of the soil. What is most impressive on these reports are the gains in elements that are often deficient in human nutrition, such as calcium, iron, and zinc. Lisa Giroux, a SOUL-preneur Success Coach, helps people find their voice, share their message, and make a powerful shift upon the planet. I was delighted when she asked me for an interview. You reap what you sow…. Are these just old wives’ tales and useless platitudes or is there deep soul wisdom within them we have ignored and the cause of mass DIS-ease upon the earth and in body, mind and soul? What is blocking you from being your best? What does vibrant health bring to your life? How can you have more, be more and do more? Let’s become our own best researcher and advocate for health and well being. Will you take your health back now? Is it possible? Dr Jana Bogs has researched for herself and has discovered some disturbing things about our food. These toxins deplete us of vitality, health and are poisoning us and the earth. There is and it begins with our foundation, the soil. Dr Jana is a soil expert and stresses the importance of creating good health by adding good stuff. Specifically adding beneficial microbes and minerals will dramatically improve every aspect of our nutrition profile and health. Have you ever wondered about the power food has on your health, your happiness and your ability to live your life? Dr Jana and I had a great time discussing the importance of Nutrition Grown Food (™), real health, and the correlation between the food we eat and how good we can feel each day. Dr Jana Bogs is the founder of Beyond Organic Consulting Inc. and the creator of the certification course Perfect Soil, Ultimate Food, Vibrant Health and True Success. Click here to learn more. Find out what is blocking you from being your best! These blockages can come in many forms. They can be emotional, environmental, and spiritual. These blockages usually start from being toxic or depleted; OR both! Which are you? It is during this time of year that we want to clear out all the gunk and junk in our lives and make room to add the good stuff. Create a healthy foundation, cultivate a healthier lifestyle and plant seeds of joy. Empower yourself with this series and Dr. Jana’s Perfect Soil Course. See more clearly the detrimental effects environmental toxins are having on food, health, and home. Go organic whenever possible. Learn about the “dirty dozen” and the “clean fifteen.” This, however, may not be enough. Dr. Jana encourages us to go beyond organic and grow our own nutrition rich food. Dr. Jana is our guide to awaken the gardener/farmer within and she is offering this interactive online course so you can learn to grow the best food ever. Then share your wisdom, experience and nutritious foods with others to increase their vibrancy and health. Dr Jana recommends genuine wellness from soil to soul. Thanks so much for your time and enjoy the course. I am Rev. Lisa Giroux Reiki Master/Teacher and SOUL-preneur Success Coach. Are you ready to find your voice, share your message, make a powerful shift upon the planet? Ready to live your life your way? I have created this series called “On the Fly Course Creation” and is great fun way to showcase new alternative health and spiritual practitioners and help them share their important messages of living a whole, healthy, happy life that they design and create a business that supports the soul. Come along and begin your journey I would love to be your guide and Divine Life Designer. It will be great fun too. You can contact me directly by calling 719.293.4157. Or book here: here is my calendar Lets have a chat! What will it be like to become one of today’s leading SOULFUL change agents? Are you ready? The time is now. The world need you and your healing work. Come along for my 7 Days and 7 Ways to Ultimate Wellness Enjoy my free gift for you here. Human health begins in the soil. Hear the fascinating details from Dr. Zach Bush, a former cancer researcher, as interviewed by Dr. Joseph Mercola. Dr. Bush started teaching his patients how to garden and change their diets to get well. Enjoy! Lesson: Listen to your internal voice. Your doctor most likely has no nutritional training, and therefore has no platform to make such an obviously flawed statement. With thanks to Dr. Peter Osborne, an excellent functional medicine doctor (one who seeks the cause of problems) based near Houston, Texas. I want to share what has been happening with me lately that may impact you or someone you know. I’ve been recovering from toxic mold exposure. I never thought much about mold. It was just an annoying thing I had to clean off of leather items, like my saddle. Come to find out, 1 in 4 people are genetically susceptible to mold biotoxin illness. (“Lucky me”, the 1 in 4.) That means they cannot clear from their bodies the biotoxins that molds put off. The biggest source of toxic mold is water-damaged buildings. The US government claims that 1 in 2 buildings in the US is water-damaged. This was the case for my illness. Living in a humid environment tends to further compound matters. You may not be able to see or smell the mold, but it can still make you gravely ill. I hope you can realize the enormity of the issue. These biotoxins create havoc by poisoning the body, causing inflammation throughout the body systems. Symptoms are extremely variable depending on the other genetics and how well the various body systems can defend themselves. Headaches, fatigue, brain fog, nausea, vomiting, and diarrhea are probably the most common symptoms, but there are many others. Most doctors don’t have a clue as to the cause of the condition, and write it off as some other disease or that it is all in one’s head. My symptoms were unusual and none of the many doctors, holistic or conventional, I have seen through the years have understood the cause. Yes, I was tested for many things, including allergies. It was not that and, yes, the allergy doctor concluded that it was “in my head”. Not! Another doctor prescribed oral, broad-spectrum antibiotics. I told her I didn’t want to further impair my intestinal flora. You really have to be your own advocate! Fortunately, some functional medicine doctors do understand mold illness. However, good luck trying to get health insurance companies to pay for office visits or tests ordered by functional medicine doctors. The genius researcher who has uncovered the truths about mold biotoxin illness is Dr. Ritchie Shoemaker. He has an extensive testing and treatment protocol. He no longer sees patients, but is training a growing number of physicians, who are listed on his website, www.survivingmold.com. Mold biotoxin illness is not a new illness, but the incidence has increased with changes in building materials and construction. With the effort to cut energy costs we now have “tight building syndrome”, which results in a greater concentration of indoor air pollution due to less air exchange. In 1969, mold-retardant paints were introduced. Just as antibiotic-resistant bacterial strains have developed due to the overuse of antibiotics, super-toxic molds have developed due to the use of mold-resistant paints. What happens is that the organisms that aren’t killed develop more resistance over subsequent generations. They proliferate because their weaker competitors have been killed off by the agent (mold-retardant paint or antibiotic). The same thing can be seen in agriculture. When nature is in balance, it is a self-regulating system, and life is good. When humans interfere in the system with toxic agents, good and bad aspects of the system, i.e. microbes or insects, are all impacted, with the bad becoming more prevalent over time due to the resulting selection and lack of competition. I am delighted to report that I am feeling much better now that I moved to a drier location, cleaned or discarded everything I own (while wearing a mold remediation mask), and got some truly helpful medication. Yes, mold remediation is a huge undertaking. Now I am happily back to my regular work of helping to grow the best foods ever!